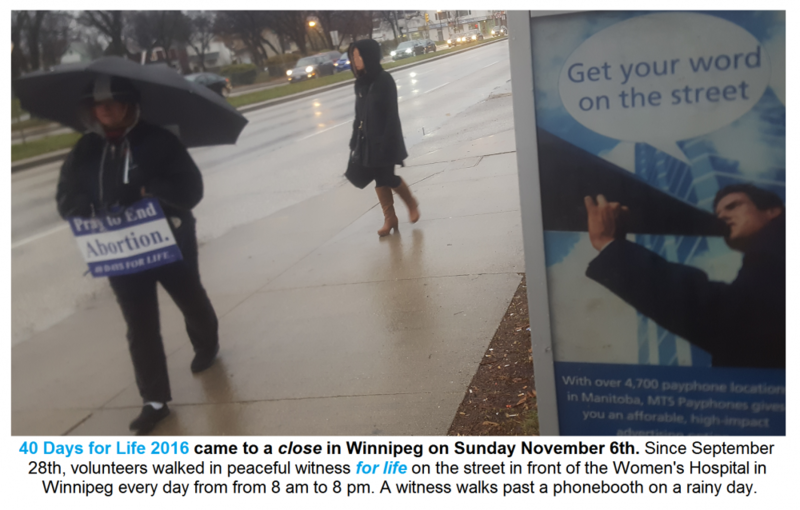 At a humble afternoon prayer ceremony in front of the Women’s Hospital on Notre Dame Avenue in Winnipeg, the local effort of the international 40 Days for Life movement came to a close for this year. 40 Days for life, that strives to keep the “Pro Life” and “Choose Life” message in the social consciousness, always chooses major focal points where people come in closest proximity to the questions of unexpected pregnancy, choosing life and struggling with the pressure for an abortion. This year, as in the past, the main entrance to the Women’s Hospital at the Health Sciences Centre was chosen. This is not the only location that provides abortions in Manitoba, but it is by far the largest facilitator in the province. 40 Days for Life, a movement that started in Texas only 12 years ago, was a new approach that invited people to come to focal points to peacefully pray and witness to their support for life. It soon spread across North America. Occasionally, people entering and exiting the hospital would stop and ask questions of those walking on the sidewalk. Volunteers came out whenever they could during their busy days to spend at least an hour in vigil… before work, after work, during the lunch break, after classes, during off days, in between shopping – sometimes before or after a visit to the same hospital! The event started on September 28th this year and ran up to November 6th. During that period, every single day and regardless of the weather, volunteers of all ages came out to spend an hour or more between 8:00 AM and 8:00 PM. Some carried signs if they were available and others just walked slowly back and forth in prayer and meditation. They came alone. They came in groups. Families came together. Parish groups, sometimes with their pastors, came for a scheduled time. But mainly it was individuals that wanted to be there. Some who had never done anything like this before, mustered the courage to do so and were glad that they did. The 40 day vigil ended on Sunday afternoon with a 2:00 PM prayer and acknowledgment ceremony. That was it. Everyone went their way home to pray about and plan the next move.